Enter coupon code (83OKRMLHPFJG) during checkout at the store to receive the discount. The King James Version Video Bible, narrated by Alexander Scourby, has many wonderful features. This edition includes the complete Old and New Testament. 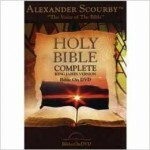 Hear and see God’s word in a brand new way with this King James Version Bible on DVD narrated by Alexander Scourby . With over 70 hours of powerful word-for-word narration and synchronized on-screen text, this Complete KJV Bible on DVD brings the scripture to life with Alexander Scourby’s expressive and inspiring voice.